Abstract: In the realm of human urban transportation, many recent studies have shown that comparatively smaller fleets of shared autonomous vehicles (SAVs) are able to provide efficient door-to-door transportation services for city dwellers. However, as a consequence of the steady growth of e-commerce and same-day-delivery services, new city logistics approaches will also be required to deal with the last mile parcel delivery challenges. 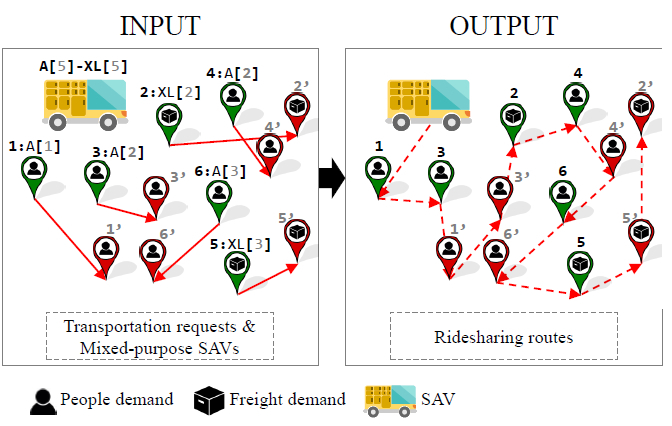 We focus on modeling a variation of the people and freight integrated transportation problem (PFIT problem) in which both passenger and parcel requests are addressed by mixed-purpose compartmentalized SAVs. Such vehicles are supposed to combine freight and passenger overlapping journeys on the shared mobility infrastructure network. We formally address the problem as the share-a-ride with parcel lockers problem (SARPLP), implement a mixed-integer linear programming (MILP) formulation, and compare the performance of single-purpose and mixed-purpose fleets on 216 transportation scenarios. For 149 scenarios where the solver gaps of the experimental results are negligible (less than 1%), we have shown that mixed-purpose fleets perform in average 11% better than single-purpose fleets. Additionally, the results indicate that the busier is the logistical scenario the better is the performance of the mixed-purpose fleet setting. Reference: B.A. Beirigo, F. Schulte, R.R. Negenborn. Mixed-purpose shared autonomous vehicles with parcel lockers: insights on integrating passenger and freight transportation. In Proceedings of the 15th IFAC Symposium on Control in Transportation Systems (IFAC CTS 2018), Savona, Italy, pp. 392-397, June 2018. Open Access.